The waters of the Dead Sea are unique, having a salt concentration that is 10x higher than ocean water. With over 21 essential minerals, the Dead Sea Salt therapeutic properties are well known for being a natural and beauty treatment since ancient times. The Dead Sea Salt original mineral composition improves cell metabolism and contributes to its restoration and regeneration. It also acts as a disinfectant and help in removing harmful substances from the skin. The sodium ions remove skin scales and improve its permeability. After penetrating into the skin, they bind the water a generate a feeling of suppleness, ideal for dry skin. Magnesium is essential for cell metabolism. Significant deficit in Magnesium has been discovered in skin scales and serum of patients with psoriasis. Magnesium supposedly affects the ripening of skin cells of psoriasis patients. Moreover, in cases of bronchi, Magnesium works as an anti-allergic agent. Potassium improves the oxidation and regulates the electrical process of the muscles in the nervous system. Asthma patients achieve good results from inhaling the salt vapors. Bromide concentration is 50 times higher than common salts having relaxing effect. Beside other minerals found in smaller amounts, the salt contains a natural tar which acts as an anti-inflammatory agent. Dead Sea Salt helps to relieve and threat skin disorder such as dermatitis, eczema, psoriasis and acne. It is also used to alleviate muscular and joint pain, rheumatism, arthritis and stiffness. Soaking in a warm bath with Dead Sea Salt relives tension, detoxifies, balances skin moisture, improve blood circulation and relieve skin irritation. Note : adding 100% Pure Essential Oil in the Bath Salts will further enhance the therapeutic effect of the Sea Salt. Dead Sea Salt Scrub combines Dead Sea Salt with luxurious Essential Oil blended with Base Oil. Sea Salt Scrub serves to gently exfoliates the top layer of dead skin cell to unclog pores, leaving the skin silky soft and smooth while stimulating cellular renewal and improve blood circulation. 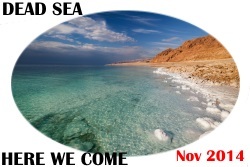 Soon, we will be making our 1st trip to Israel, and spend some time in the salty water, applying mud all over our body. 31st Oct - 13th Nov 2014! LORD, bless us with journey safety, watch over all of us, and show us amazing things we have not seen before. We know we will a great time, never to forget what You are going to do.